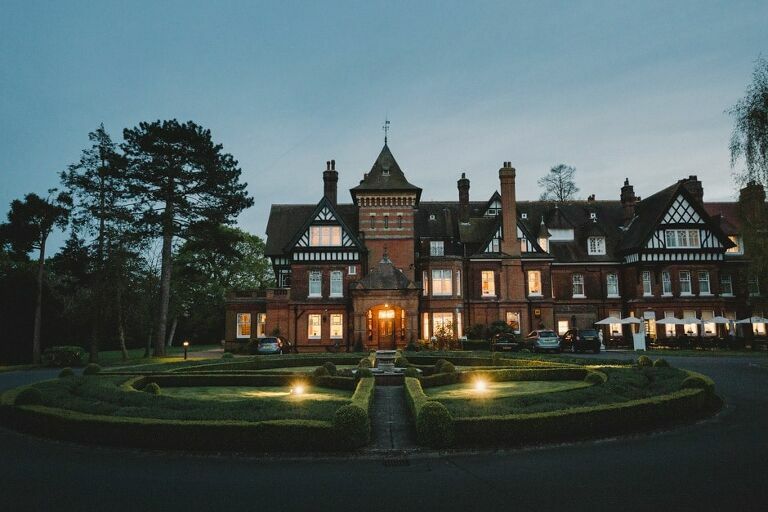 Built in 1885, Woodlands Park, located just one mile from Cobham and Leatherhead, is a quaint traditionally maintained Victorian mansion set in eight acres of secluded woodland grounds. This grand country house, a popular haunt at the turn of the century for the then Prince of Wales, retains classic architecture with its high vaulted ceilings, antique furnishings and oak panels, yet evokes a warm and welcoming feel – an idyllic romantic setting for a memorable wedding celebration. Additionally, the impressive entrance and landscaped lawns provide a beautiful backdrop for capturing photographic memories to treasure. Licenced for civil ceremonies, accommodation within Woodland Park is both spectacular and ornate. Choose to descend the staircase of the Grand Hall to greet your guests in style or alternatively the light and airy Prince of Wales Suite or Cornwall Suite which open out onto private landscaped gardens. Both are ideally suited for ceremonies, wedding breakfasts or evening receptions and can easily cater for up to 150 guests. Smaller, more intimate rooms are also available including a chapel style Oak Room with stained glass windows and oak panelling for those who prefer a more authentic setting to make their wedding vows. The hotel offers a vast array of accommodation. All 57 bedrooms are naturally light and spacious, overlooking the extensive external grounds, and include tasteful modern décor, flat screen TVs, CDs and DVDs. Rooms are available to cater for all family needs and the grand Master Suite is ideal for use as a Honeymoon suite. Situated off the Grand Hall balcony, this is a large open plan living space featuring an exquisitely carved wooden bed, dining room table with chairs, and large contemporary bathroom. The suite has full floor to ceiling glazing affording scenic views over the beautiful exterior lawns. And for a special exclusive touch, Woodlands Park allows you the opportunity to enjoy sole use of the mansion for the day with a selection of all-inclusive wedding packages. Dream of being a princess for the day with tailor made services designed to suit your budget. Reception drinks, three course menus, tableware and linens in colour schemes to suit, floral centre pieces, toastmasters, overnight accommodation in the Master Suite and more – there are wedding packages to suit all budgets and tastes. Packages can also be seasonally adapted – winter brings deep rich velvety colour schemes, cosy inviting open fires and hearty warming menus whilst lively, vibrant spring and summer shades, delicate summer wines and light salads contribute to an overall sunny atmosphere. Possibilities are as limitless as imaginations. Woodlands Park Hotel also offer a selection of menus for wedding breakfasts and evening buffets with options for vegetarian, those with special dietary needs and children. Create an extra special wedding meal from the wide variety of canapes, starters, mains, desserts, cheeses and wines available and allow your guests a unique opportunity to sample exquisite cuisine. Woodlands Park Hotel is both stylish and sophisticated. An unusual insight into the grandeur of the Victorian era with a combination of modern day amenities and a convenient yet stunning location. A wedding celebration staged here is sure to please. For other wedding venues inspiration, take a look at Surrey Wedding Venues page. If you’d like to enquire about my availability for Woodlands Park please get in touch here.